Throughout the year, as contractors register their jobs, we are presented with many blog-worthy projects. What makes a project blog-worthy? Well, not only does it look amazing, but it comes from contractors who are eager to provide us with feedback, awesome photography, and stories about how working with DaVinci Roofscapes’ luxury roof products has done what we all strive to do…make our customers happy. Last year we put our heads together and chose four projects installed by four members of our program that we could feature in our booth at the upcoming International Roofing Expo in New Orleans. So with four weeks left until the IRE, the first project up was installed by McRay Roofing out of Oklahoma City. Bellaforté Slate in the European Blend was used on this steep slope (super steep slope) roofing project located in Norman, Oklahoma. 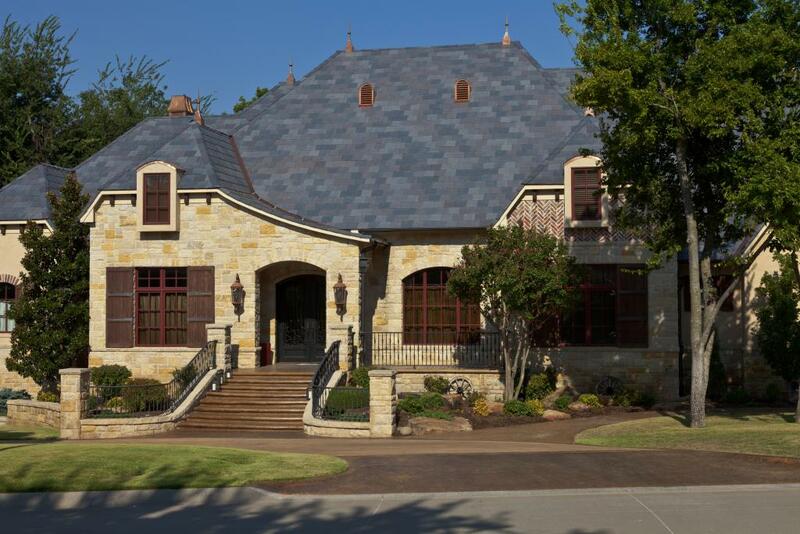 What makes a DaVinci polymer roof tile appealing in the state of Oklahoma? Three words – Class 4 Impact. Achieving a Class 4 Impact Rating means that a roof is less likely to suffer damage during a hail event, and if you have ever replaced a roof because of an insurance claim, you know it isn’t something you will want to do again. Many homeowners end up with discounts on their policies by switching to a Class 4 rated roof! Be sure to come and see us, see this project, and the other 3 chosen to be featured in our booth at the International Roofing Expo located in New Orleans in booth #1357.